Figure 16.1. "Smooch*' vs. "abrupt" climate change (as defined in the text) will have very different impacts on developed and developing count ricv Adaptation will likely not be an option if human perturbation* Co the climate system trigger abrupt changcs. Wc now know from icc corc records that there have been very large and sudden climatic changes in the past on at least a regional scale. For example, icc core records have shown that the mean annual temperature in the North Atlantic region has changed by as much as 10 or 12° over periods as short as a few decades, that is, within one human lifetime (e.g.. Alley et al., 1993). In some periods, the climate undergoes such changes several times as if it is oscillating between two very different states before settling on one for a longer period. So the first step in approaching climate impacts studies is to determine how likely it is that the climate will undergo such sudden shifts, as a result of perturbations by-human activities, before stabilizing. (I term such shifts "abrupt" change, as opposed to the nearly monotonic change in temperature projected by most GGMs for the next century at least, w hich I term "smooth" change.) To clarify this issue, wc could make the very simplistic and rather provocative hypothesis, summarized in Figure 16.1, that if the Earth experiences smooth climatic change over the next century, then the developed world at least will be able to cope reasonably well with such change, as some technological optimists assert, and the emphasis should then be on adaptation instead of mitigation. It is a different situation for the developing world, however, where even smooth climate change will likely lead to severe impacts. 'lTie issue, then, is the transfer of technology and management expertise from the developed to the developing world. On the one hand, if the climate system will undergo abrupt change, even the most technologically advanced nation will have extreme difficulty coping. In fact, it is hard to imagine any modern society surv iving the kind of change recorded in the Greenland ice core records. And it is important to note that many of the Karth's most technologically advanced regions border the North Atlantic. |ScenariolSil WM Imi Figure 16.2. 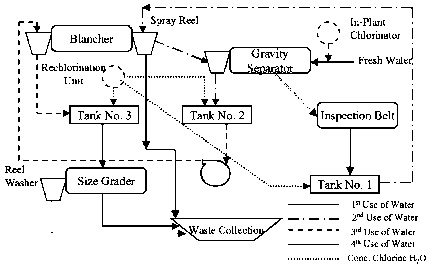 A schematic diagram of the "pollution pipe*" approach to climate impact studies. arc worth noting in this context: (i) The climate system is now experiencing a mix of forcing functions that it has never experienced before and probably at a rate that it has not experienced for millions of years, (ii) Highly nonlinear systems, such as the Earth's climatic system, arc probably more prone to sudden, sharp changes when the magnitude and rate of the forcing increase (see Schneider, Chapter 6, this volume). This is a more powerful argument in support of mitigation activities than arc a whole bundle of economically oriented studies purporting to show that the costs of smooth climatic change outweigh the benefits. Now let's assume that for the next century at least, none of the Earth's regions will experience abrupt climate change. With respect to smooth climate change, the classic approach to studying impacts has been a rather linear paradigm consisting of a climate change scenario driving a biophysical impact, which, in turn, leads to a socioeconomic consequence; this approach is sometimes referred to as the "pollution pipe" approach (Larry Kohlcr, personal communication, sec Figure 16.2). There arc several serious flaws in such an approach. 1. Each of the modeling steps carries w ith it its ow n range of errors, and these can easily propagate through the modeling chain until the final result has such wide error bars that it could mean anything. 2. Becausc the focus is on climate change, the many other factors that affcct the biophysical and socioeconomic systems arc held constant, thus isolating the impacts of climate; this can often have the effect of magnifying the climatic impacts. 3. Ik-cause climate has at least some effect on many human activities, isolating and magnifying these effects and then listing them region by region or sector by sector can lead to a "sky is falling" syndrome, in which global change scientists appear to be the prophets of doom and gloom; this can easily lead to a loss of credibility of the global change scientific community. Figure 16.4. The modeling framework for the IGBP study of subsistence rangclands in southern Africa (Odada et al., 1996). Here, climate change is viewed as one of several interacting drivers of change, both biophysical and socioeconomic, impacting the ability of rural populations of the region to achieve sustainable livelihoods. and experts on the affected systems is much more effective ihan a simple "handover" of information from scenario to impacts analyst, something that occurs in the pollution pipe approach. The best example of the integrated systems approach is the suite of studies on the impact of climate variability on agriculture, in which a crucial first step is to understand the agricultural system potentially impacted and the type of climatic information that is useful (Hammer, 1997). Figure 16.5. 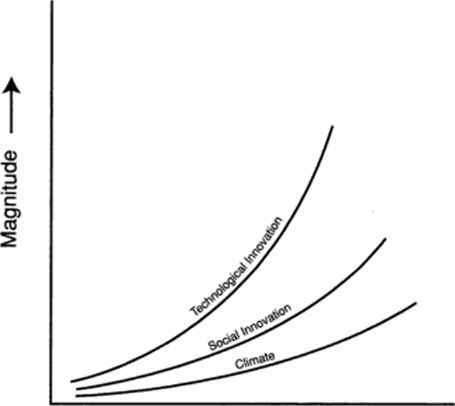 A schematic view of the relative rates of change of technology, social innovation, and climate (L. Kohkr, personal communication). societies arc changing on even faster time scales (Figure 16.5). As the result of rapid changes in technologies and social systems, problems, identified in today's context and projected into the future, may simply disappear just when they are projected to be most severe. The classic example is the prediction that European cities would be buried in meters of horse manure as they grew and as transport demands increased. Another example is the patenting of more than 1000 "smoke-spark arresters" for wood-burning steam locomotives in the United States. None were effective enough to be adopted. This problem, which was projected to cause widespread, severe forest fires, was solved instead by a more fundamental shift in technology: the switch from steam to diesel and electric locomotives (Gruebler, 1998). The lessons from these and many other such examples are that (i) predicted environmental damage, projected from an understanding of present-day systems and drivers, often doesn't occur; (ii) ideally, impact studies should include a range of "technology trajectories" that attempt to project possible tcchnology-drivcn changes to systems (e.g., food production systems); and (iii) more emphasis should be placed on sensitivity studies, as noted above, in an attempt to tease out those systems in which improvements in technology or management are unlikely to mitigate projected changes in the climate system. It may then be more fruitful (and believable) to focus climate impact research on those areas rather than take a blanket scctor-by-sector or region-by-region approach. • Abrupt climate change has the potential to cause massive and irreparable damage to human societies. A first-order priority in climate system research should be to understand better the nature of these abrupt changes in the climate system and to discover whether human perturbations to the climate system are pushing it toward such changes. • The earlier linear, pollution pipe approach to climate impact studies should be abandoned in favor of a systems approach. 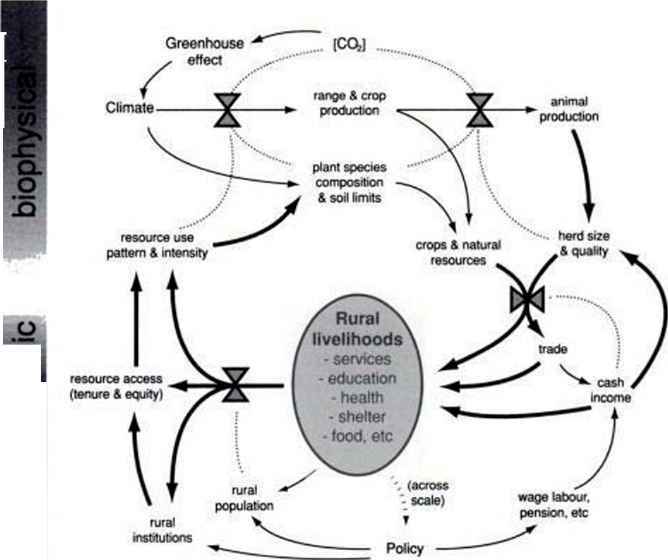 • In a systems approach to climate impact studies, the emphasis is on the complex system being impacted and its response to multiple, interacting drivers. Climate change is probably best viewed as a perturbation to existing drivers of a system. The challenge is to determine when and for what systems global change may become a significant perturbation. • The adaptability of human societies and their technologies to environmental challenges, although not always sufficiently effective, nevertheless should not be underestimated. Modern human societies have some potential, given an appropriate big picture of what global change is and what its potential impacts are, to use "adaptive management" or "fuzzy control" techniques to navigate toward a more sustainable future without an intervening environmental catastrophe (Schcllnhuber, 1998).